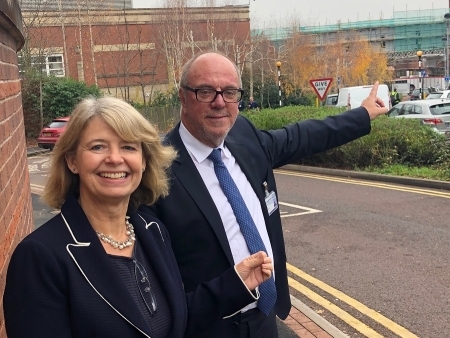 West Worcestershire MP Harriett Baldwin has been briefed on plans to add extra capacity to the county’s main hospital ahead of extra demand this winter. And the MP visited Worcestershire Royal Hospital to see the new bridge, which will shortly be completed connecting Aconbury ward to the main hospital building. The first phase of the construction work, which is part of a £27 million project to increase capacity at the busy hospital, is expected to be completed next month. The improvements will mean an initial extra 28 beds to help deal with rising demand during the winter months as well as allowing the use of other beds in the Aconbury buildings to provide care for more acutely ill patients than has previously been possible. Harriett commented: “I had a really constructive meeting with the management team to talk about how they are preparing for winter pressures. They have a clear plan to make better use of the resources across the county to make sure that people get the best possible urgent care in the right place. “These changes go hand-in-hand with some major capital investment to create extra bed capacity and working closer with the Worcestershire County Council to improve the process discharging patients from hospital to step-down care or their own homes. “We all agree that it is crucial to help take the pressure off the Emergency Department and I am keen to repeat the message that people should only visit A&E if it is an emergency. “You can get expert advice by ringing 111 and where possible visit your GP, a Minor Injuries Unit or even get advice from a pharmacist. Photo: Harriett Baldwin MP is shown the new bridge construction work with Worcestershire NHS Acute Trust chair Sir David Nicholson.